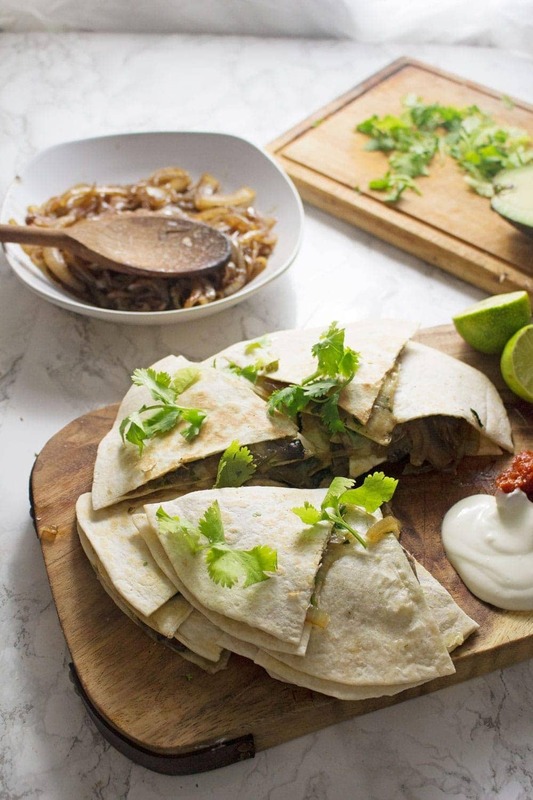 These portobello & caramelised onion quesadillas are the perfect vegetarian dinner when you’re craving something full of Mexican flavour! Christmas is just such a busy time isn’t it? 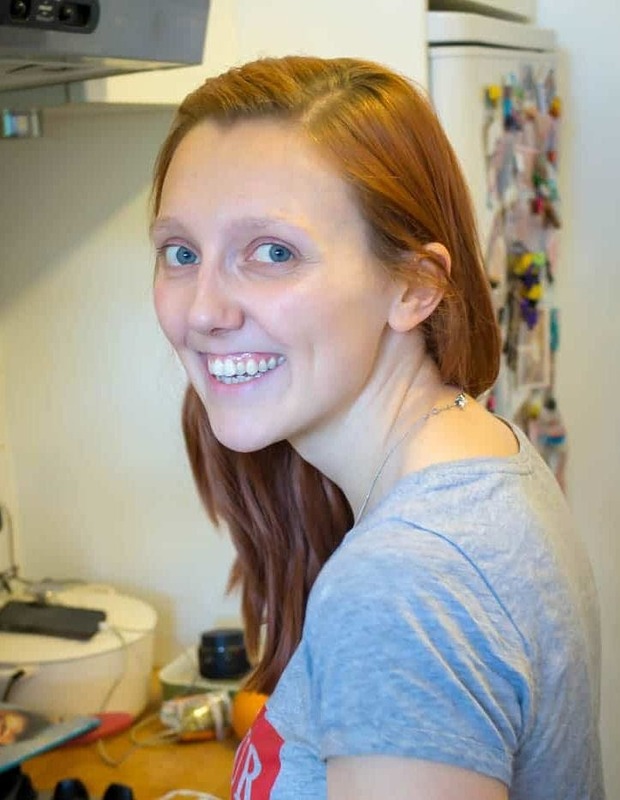 I’ve had so much going on, been feeling pretty overwhelmed but today was my last day at work for two weeks so I finally have a bit of time to devote to my blog! I have missed you! I had all sorts of plans for things I wanted to share in December but it’s just been so manic. I will pick back up in January and come up with some really exciting stuff to celebrate a whole year of blogging (!) 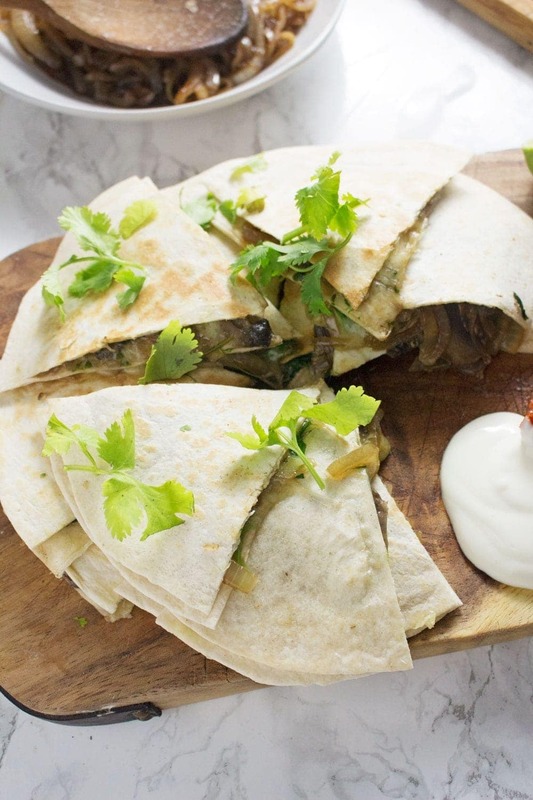 but for now I have a few really yummy recipes left to round out your Christmas countdown starting with these portobello & caramelised onion quesadillas served with a delicious quick chipotle jam. So these quesadillas then. We really love a good quesadilla. In fact any Mexican food will work for us and if you can make it a bit healthier and vegetarian then there’s really no excuse not to eat a lot of it right? Everything comes together pretty easily for these. 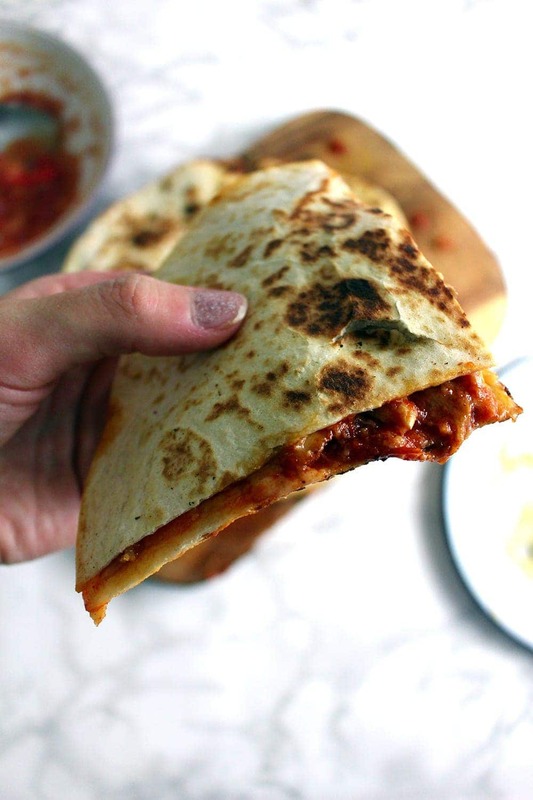 The chipotle jam can bubble away while you make your quesadillas and then you can throw everything on a plate with all you favourite toppings. We chose sour cream and coriander while Will added some avocado which I carefully avoided as you know all about my aversion to avo. We popped a bit of rocket in these with the portobello mushrooms, caramelised onions and cheddar. 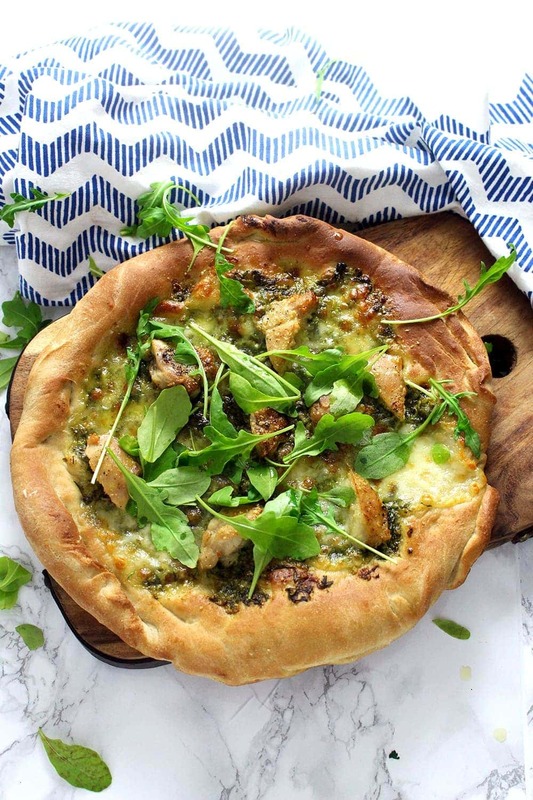 It’s a perfect combination of flavours and tastes just as indulgent as a meaty version! 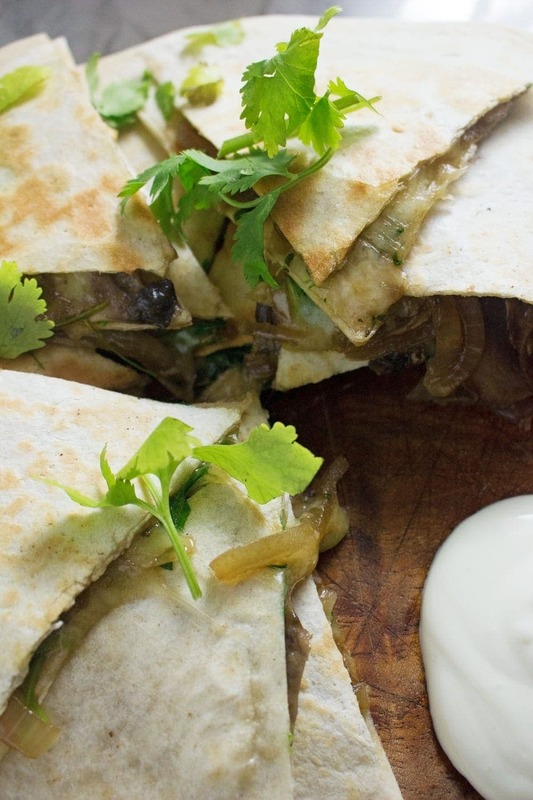 WONDERING WHAT TO DO WITH THE LEFTOVER INGREDIENTS ONCE YOU’VE MADE THESE PORTOBELLO & CARAMELISED ONION QUESADILLAS? 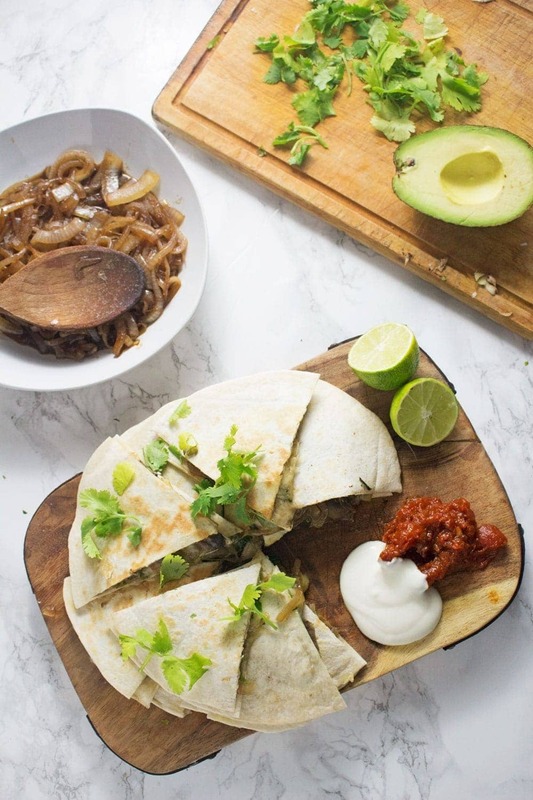 These portobello & caramelised onion quesadillas are the perfect vegetarian dinner when you're craving something full of Mexican flavour! Make the chipotle jam. Place the chipotle chillies, pasata, garlic, white wine vinegar and brown sugar into a small saucepan over a medium-high heat. Bring to a boil and simmer for half an hour while you make the quesadillas. The leftovers will keep in the fridge in an airtight container for a few weeks. For the caramelised onions heat a tbsp of oil over a medium heat and add the onions. Cook for 10 minutes until they are soft then add the vinegar and sugar, cooking for another 5 minutes until they're caramelised. 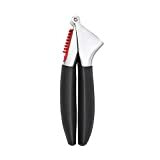 Remove from the heat and tip onto a plate. Place the pan back on the heat and melt the butter. Add the mushrooms and garlic to the pan and cook for a few minutes until softened. Remove from the heat. Assemble the quesadillas. Top one tortilla with a quarter of the onions, mushrooms, cheese and rocket. Add another tortilla. 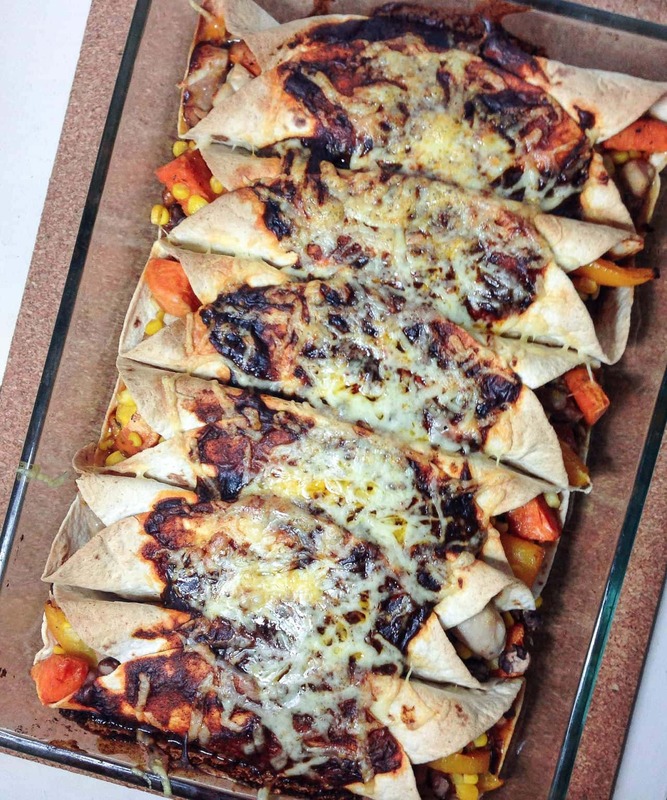 Heat a dry pan over a medium-high heat and place the quesadilla carefully into the pan. Cook for a few times and then flip and cook the other side until they're browned. 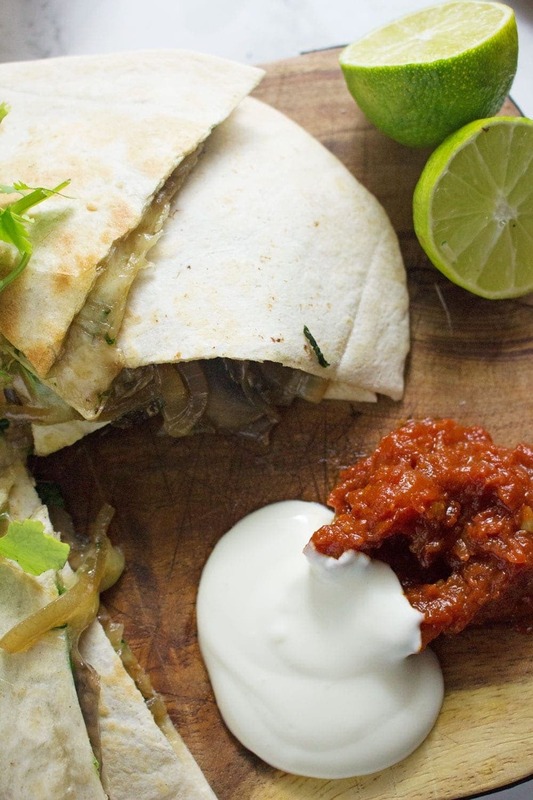 Repeat with the rest of the quesadillas. Serve with the chipotle jam and any other toppings. What’s not to like about a recipe with caramelised onions? I am fond of them! Never made quesadillas with onions though! Always good to know there are good ideas to explore! 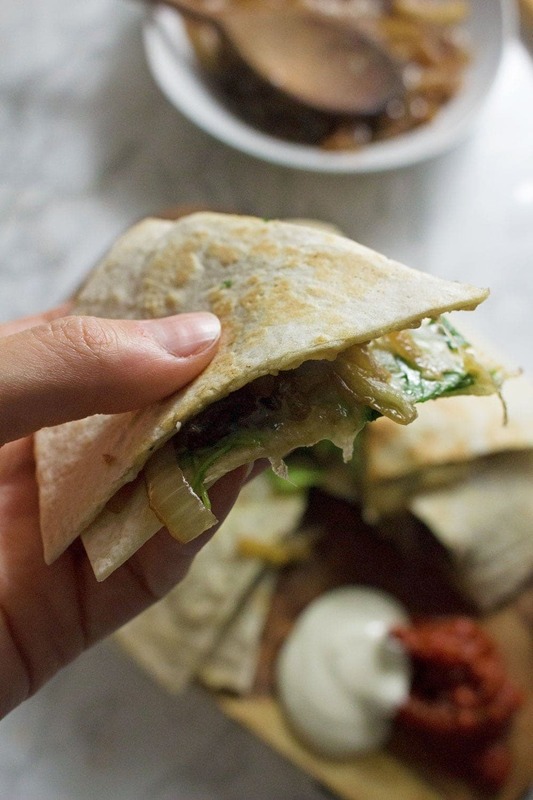 I love how you can do just about anything in a quesadilla! This one sounds great! Such beautiful quesadillas! The flavors sound incredible. I love the combination of portobello mushrooms and caramelized onions. 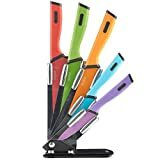 They look delish! Love it.